Music's royal family has officially grown by two. Beyoncé and Jay Z welcomed twins earlier this week at the UCLA Medical Center in Los Angeles, according to sources. The new bundles of joy are Jay and Bey's second and third children, joining 5-year-old daughter Blue Ivy. Beyoncé, 35, announced her pregnancy in February by sharing a glamorous Instagram photo of her burgeoning baby bump. 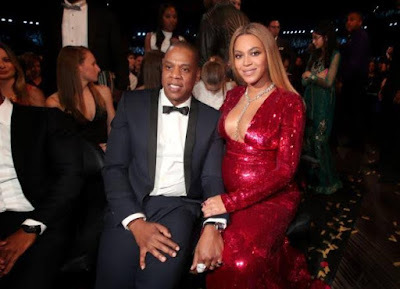 The 22-time Grammy winner wrote at the time that she and the "99 Problems" rapper, whose real name is Shawn Carter, had been "blessed two times over." "We are incredibly grateful that our family will be growing by two, and we thank you for your well wishes," she captioned the Instagram snap. Beyoncé debuted her baby bump weeks later at the Grammys, where she captivated the audience with a slow-paced, visually eye-popping performance celebrating the wonder of motherhood. During the elegant presentation, Beyoncé was clearly pregnant in a form-fitting dress and veil as she belted "Sandcastles" and "Love Drought" from the comfort of a chair. She had been scheduled to headline both weekends at the Coachella music festival in Indio, Calif., but was forced to cancel after doctors advised her to take on a less rigorous schedule as she neared the end of her pregnancy. Perhaps that's why she was also notably absent from the Met Gala weeks later, where for years she's been known to close the red carpet with a show-stopping look. Beyoncé continued to share photos of her precious baby bump with fans on social media, including a few that showed her wearing a shirt that reads "Preggers" at the beginning of May. The songbird and the now 47-year-old Jay Z welcomed their daughter Blue Ivy in a luxury suite at Lenox Hill Hospital in February 2012. The much-ballyhooed birth caused quite a commotion, as other new parents said the famous family’s security made getting around the hospital impossible. The singer and her husband are the latest celebrities to welcome twins, joining a list that also includes Jennifer Lopez and Marc Anthony, as well as Mariah Carey and Nick Cannon. George Clooney’s wife Amal recently gave birth to twins — a boy and a girl — as well.